Jake Tapper and Benjamin Wallace-Wells are our guests this week. Original Air Date: June 2, 2012 on SiriusXM Satellite Radio “POTUS” Channel 124. Polioptics airs regularly on POTUS on Saturdays at 6:00 am, 12 noon and 6:00 pm. My apologies for the late posting of this week’s show. I’m just back in NYC tonight from Swarthmore College, outside of Philadelphia, where I joined my classmates for a wonderful 25th reunion of the Class of 1987. As one might expect, the 2012 election was top-of-mind chatter. But the 1984 campaign was also buzzed about. On a beautiful Saturday afternoon on Parrish Lawn, my old friend John O’Reilly reminded me about how we monitored election returns between Ronald Reagan and Walter Mondale. 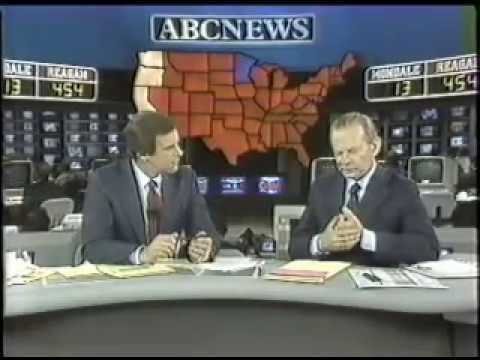 John, Dan Feibus and I erected a makeshift version of the ABC News “Big Board” election night set (we were big fans of Peter Jennings, David Brinkley and Hal Bruno — now, sadly, all passed) and presented our own production of “The ’84 Vote” for our fellow classmates more interested in entertainment than real reporting. As the ABC team made state-by-state projections, the results would be relayed into my ear through a Radio Shack transistor earphone. I’d share the news with our audience in the Willets Dormitory common room (the crowd assembled thanks to a tapped keg off set). We would place a red or blue state on the Big Board, though red was the color of the day — Mondale would only carry Minnesota, his home state, and the District of Columbia. The landslide notwithstanding, the show still had to go on. That’s where O’Reilly, a Democrat, and Feibus, a Republican, kicked into full gear, picking each other apart like an early version of Hannity and Colmes, 12 years before that show would take to the air. It was more like Dan Aykroyd and Jane Curtain. Those were the days. Now, onto our show, Episode 58 of Polioptics. Speaking of ABC, on this week’s broadcast we were very pleased to be joined by Senior White House Correspondent Jake Tapper, a journalist who shares many of Jennings’s best attributes as a reporter. I’ve known Jake since the late 1990’s when he was earning his chops as a reporter for Washington D.C.’s “City Paper.” Our conversation centered on the take-no-prisoners combativeness of the Obama Campaign as well as an issue that has taken Tapper well off his White House beat: his upcoming book covering combat in Afghanistan. Later, we look at Romney for President, the 1968 edition: Ben Wallace-Wells deconstructs his 6,000+ word piece for New York Magazine on Gov. George Romney and the progressive forces that drove him to challenge Nixon for the GOP Presidential Nomination, and what happened to him in the process. 1. 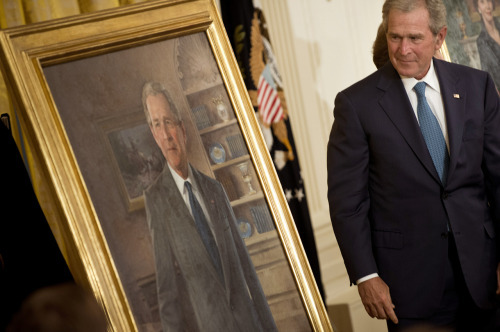 In Washington, Presidents Bust 43 & 41 joined President Obama 44 at the White House for the unveiling of 43’s official portrait, a rare open-air meeting of a quorum of The President’s Club and a rarer-still moment of comity meeting comedy in the nation’s capitol. Remember this kind of moment, it doesn’t happen often. Our regular listeners will recall that we had Nancy Gibbs, author of the new book, The President’s Club, joined us on the show two weeks ago for a great conversation on why once rival presidents seem to find ways to get along — it’s worth a listen. 2. 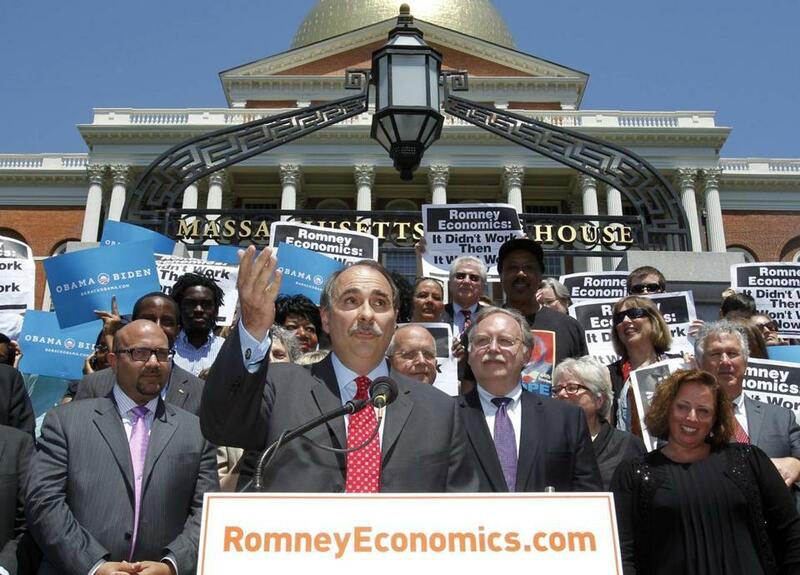 But while Obama was making nice to the former GOP standard bearer at the White House, in Boston, Obama campaign advisor David Axelrod ventured into the belly of the beast, backed by a phalanx of Bay State Surrogates, and hammered at the record of current GOP standard bearer when he served as Governor of Massachusetts. Very interesting was the use of Axe, more of the strategist and media spokesman, who hits hard at the GOP in closed door fundraisers, but doesn’t often get behind the podium at “open press” events. Here in Boston, adjacent to the Augustus Saint-Gaudens-designed monument to Robert Gould Shaw and the 54th Massachusetts Regiment, he served as the lure for the national cameras to the State House steps. This was not an event that Barack Obama would ever do himself. Nor would Vice President Biden be so in-your-face. So who else can you use to stay doggedly on message and not be intimidated by the crowd at a road game? Axelrod is the thick-skinned surrogate who can draw a crowd of national press and parry the counter-protests that such an appearance is sure to draw. 3. Even more interesting than Axelrod in Boston — to this visualist, anyway — was Mitt Romney in Fremont, California, standing in front of the shuttered headquarters of Solyndra, the solar power company that President Obama visited two years ago amid an effort to showcase successes from the Administration’s stimulus package. While news reports were quick to poke holes in claims Governor Romney made at the site, this was a bold visual that will show some legs during this campaign. It’s just the kind of image that stands out compared to the usual blue drape speech or town hall meeting. This venue, this backdrop, this image, this tactic — all make a statement in itself, without Romney needing to say a word. Michael Deaver would have loved it — when a picture is persuasive and a story can be told even with the volume muted on the television set. The event was also well-timed within the same news cycle to blunt the impact of Axelrod’s “one-if-by-land” march on Boston. Kudos to the Romney campaign, which has been pretty timid thus far with its strategic scheduling and creative stagecraft, for this guerilla tactic. They had to shroud the visit in secrecy and execute it fast. Advance teams dropped down a podium, attached a mult box and unloaded the press pool, not unlike a president visiting a war zone. Had they telegraphed their intentions, the risk was high that they could have got knocked off-message or somehow found themselves prohibited from visiting the site. 4. Finally, an event in Greensboro, North Carolina on Thursday wasn’t related to the 2012 campaign but was rather a leftover crumb from the 2008 campaign. The U.S. Government tried to convict former Senator John Edwards of violations of campaign finance laws which, if found guilty, would have sent Mr. Edwards to prison for up to 30 years. As the trial jury reported after their deliberations on Thursday, they acquitted Edwards of one of the counts against him and were hopelessly divided on the other five counts. U.S. District Count Judge Catherine Eagles declared a mistrial. The current thinking is that the government will not attempt to retrial of the disgraced former senator, presidential candidate and vice presidential nominee. Whether we believe those words or not probably doesn’t matter. We are not the aggrieved party. The visual of him flanked by his parents and his progeny gave him generational cover fore and aft. That’s about all he can ask for, or expect.